It’s almost a meme unto itself — all those Creaster people. The internet defines this term as a person who attends church on Christmas and Easter. While some people are a little critical of this phenomena, I think it’s absolutely wonderful! Attendance is high! There are new people in the seats! Talk about an amazing opportunity. This tradition of going to church on the holidays means that you will have new guests and families coming through the doors of your church this Easter. Lives will be changed! Don’t just dust off the same sermon series you’ve done dozens of times. This is the challenge of the season for every pastor, how do you see the Easter story through new eyes every year? When you are dealing with some of the most familiar Bible stories, it is a struggle to teach and present them in new and exciting ways. 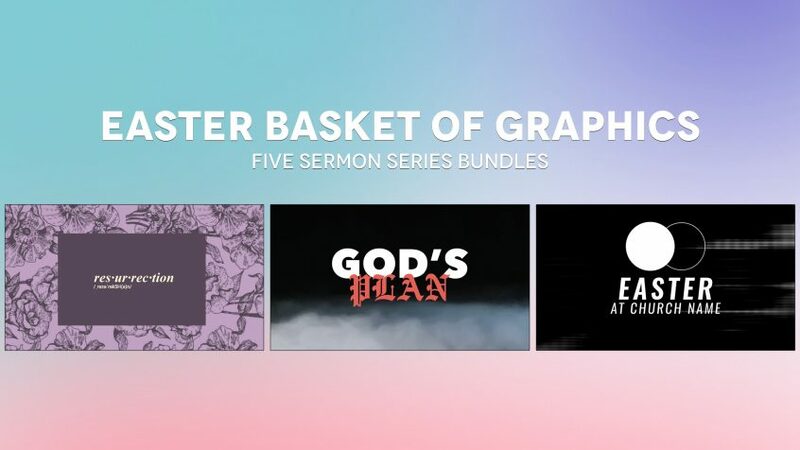 We made this bundle to give you a fresh take on a timeless truth. To wrap it all up we made a Communicators Checklist to help you prepare for Easter without going crazy. Simply print it out, fill it out, and update it as you go! This bundle has over 40 pieces of content — all free & all yours. We give all this stuff away, because we have a heart for the local church! If you would like to reach out to our team about coaching or curriculum, please just shoot me an email! Our team would love to touch base!